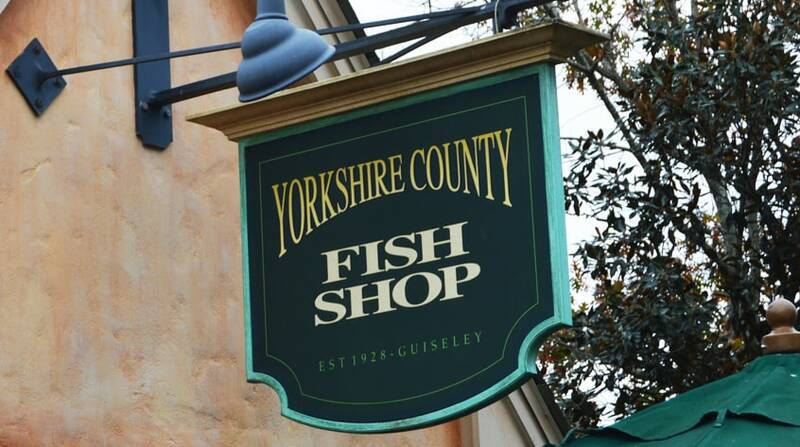 The Yorkshire County Fish Shop is a tiny counter in the United Kingdom pavilion on the World Showcase at EPCOT. Simply walk up, place your order, pay and move to the right where you’ll pick up your order. The menu isn’t vast—this window serves fish ‘n’ chips—or fried fish and French fries for those of us who aren’t British. A fish ‘n’ chips basket costs $11.49, and drinks cost $4 or less, so everyone can eat for under $16, unless you add dessert, which costs around $4 more. There’s no dining room because Yorkshire County Fish Shop is only an order and pick-up window, but seating is available nearby. Seat yourself and enjoy the view of the World Showcase across the lagoon.